Darrem Charles Arm Training For Explosive Growth! With this program your arms are going to grow like crazy and everyone will notice in the gym - or anywhere you go for that matter. If you want arms like Darrem Charles', you need to train like him. Try it now! There's only one program that Darrem Charles uses to build his tape-tearing bi's and tri's. 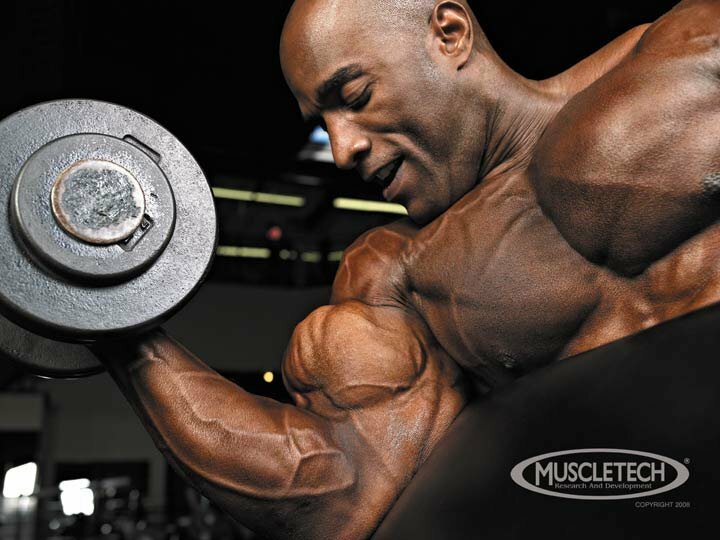 Outlined here for you is Darrem Charles' very own arm training program to build freaky muscle for huge, skin-stretching arms as fast as possible! With this program your arms are going to grow like crazy and everyone will notice in the gym - or anywhere you go for that matter. If you want arms like Darrem Charles', you need to train like him. Each champion-caliber training session will exhaust your arms completely, pumping them so full of blood that your muscles have no choice but to grow! Your muscles will get annihilated from all possible angles and will recruit all the muscle fibers you need to force more strength and inches onto your arms in as little time as possible! Follow this training program and you'll be guaranteed to blast your way to freaky arms fast - just like 11-time IFBB pro, Darrem Charles! Notes: This is the movement that makes Darrem's triceps seem to explode out of his skin. He uses cable pressdowns as an isolation movement that not only adds more size, but more definition as well. He performs this movement with strict form to maximize the muscle fiber recruitment. This movement is also essential for adding bone-crushing strength to your big bench when it comes time to blast your pecs! And don't forget, your tricep muscles make up two-thirds of your upper arm development. Train them hard and you'll build arm size that gets noticed! Technique: Using a rope attachment at the cable station, grip the ropes firmly with both hands, palms facing in. Bring the elbows in tight to your sides and keep them there throughout the entire movement. Push down on both sides of the rope simultaneously, focusing on peak tricep flexion as you get close to the end point of the motion. Pause at the bottom for a two count before slowly allowing the weight to come back to the starting position. To induce an even greater muscle pump, flare your wrists out distancing each side of the rope from one another at the bottom of the movement. Notes: This movement is a staple in Darrem's training cycle because it forces a ton of thickness to all three parts of the tricep. Darrem's form is slightly unorthodox, however, his eye-popping results speak for themselves. So listen to exactly how he describes this movement. 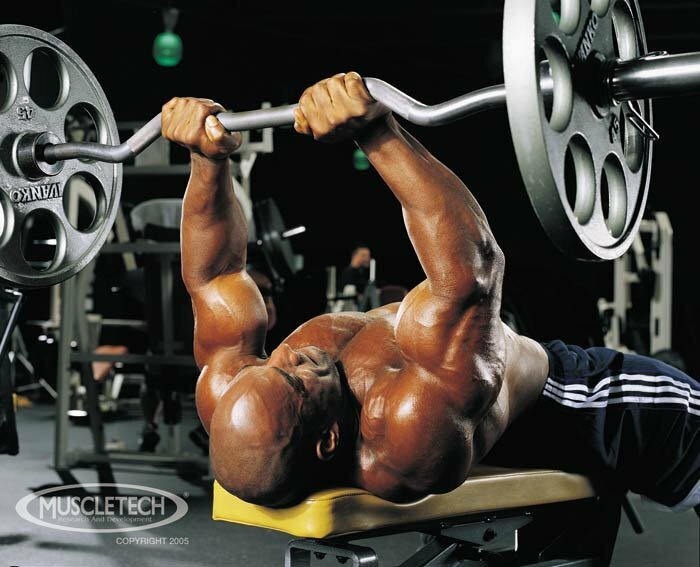 Technique: Lay down on a flat bench with your head at the very end of the bench. Hold a barbell with palms facing up. Your arms should be pointing almost straight up, with a slight bend at the elbow, titled slightly toward your head. While keeping your shoulders stable, bend only at the elbows to lower the barbell until it is above your forehead. You can also challenge your triceps further by lowering the barbell a few inches below the bench line while keeping your elbows from flaring outward. Slowly extend the barbell back to the starting position where your elbows are nearly locked. This unique movement has been a part of Darrem's training since day one. And now, two and a half decades of training later, he has some of the best arms in the IFBB! Notes: Darrem powers through this ultimate training movement to issue the final blow to his tri's. This movement forces your triceps to bulge outward like your biceps, and this new size will make your triceps pop from any angle! Perform this movement as strictly as possible to get the most out of each set. The variety in rep range will help shock your triceps, pushing your development to the point where you'll be able to see the vascularity pushing through the skin in your arms! Technique: Stand to the right of a flat bench. Resting your left knee on the bench, place your left hand ahead of you on the bench for balance. Holding a dumbell in your right hand while keeping your back as straight as possible, bend your arm and raise your elbow up to shoulder height. Let the dumbell hang down while keeping your elbow close to the side of your body. Press the weight back behind you until your forearm is parallel to the floor. Squeeze your triceps and then slowly return to the starting position. After you finish the set, switch sides. To avoid swinging the weight for momentum, keep your shoulder stable, moving only at the elbow. After a few reps you should begin to feel an intense burn in your outer triceps area. Now that you've beaten your tri's into total submission, you're ready to start developing the crazy peaks in your biceps that IFBB superstar, Darrem Charles is known for! Notes: For overall mass, dumbbell curls are a must for Darrem Charles. This "bread-and-butter" curling movement is a must for anyone who wants big arms. He's done them every week since he turned pro. A habit that has built the mountainous bicep peaks he is known for. This exercise allows him to achieve a full range of motion while getting a maximal stretch at the bottom of the movement. Keep the form strict and you'll get a crazy sleeve-splitting pump. Technique: Hold two dumbbells with arms extended down. Curl the dumbbells up and out, one arm at a time. At the top of the motion, turn your wrists slightly as the weights are raised. This will help you squeeze your bicep to fuller contraction, forcing a bigger bicep peak to your guns. Then, slowly lower the weight, resisting all the way down. Notes: Biceps are powerful muscles, but they tire quickly. Darrem uses just a few, high-intensity sets where he can really exhaust the muscles from many different angles. This is enough to trigger the growth response you need for freaky guns. Technique: With your hands shoulder-width apart, grip a barbell with an underhand grip. Stand straight up with your shoulders squared and with your feet shoulder-width apart. Without swinging the weight, curl the bar up toward your chest in an arc. Keep your elbows in the same place and close to your sides. Bring the weight up as high as you can and squeeze the biceps at the top to pull as much blood into the area as possible for a great pump. Lower the weight slowly, resisting all the way down until your arms are fully extended. Notes: Darrem considers this an isolating movement because it really focuses stress on the short head of the bicep. And the short head of the biceps is what gives it the peak. It also adds to fullness at the lower portion of this muscle. Darrem regards this to be one the best movements for enhancing overall size. Using a regular preacher bench, hold the dumbbell with an underhand grip while locking your elbow firmly in place in an extended position on the bench. Slowly curl the dumbbell up, until your biceps is fully contracted. Make sure to squeeze your biceps at the peak of the contraction. This will force maximum blood into the area, exposing rope-like vascularity! Click Here For A Printable Log Of Training Program For Massive Bi's And Tri's. It takes hard work to build massive, attention-grabbing arms like the pros, but if you follow this program exactly, you'll be able to blast your way to a pair of freaky arms that are thick and massive from any angle just like "The Sultan of Symmetry," Darrem Charles! Tons of people are using them everyday with great results.